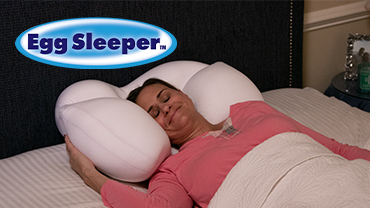 Egg Sleeper™ pillow cradles your head and supports it at the perfect position to help alleviate neck & back pain. Evenly-dispersed micro-air spheres allow proper air ventilation through the pillow and allow you to reshape as needed. That uncomfortable pillow keeps you up all night. You fold it, flip it, and fluff it, but it's never quite right. Well, not anymore. Introducing Egg Sleeper™, the incredible new pillow that's so comfortable and supportive you can run over it with eggs inside and they just don't break. READ FULL DESCRIPTION You can sit on it with all your weight and not crack a single egg. It's a super-soft, ultra-comfortable pillow that gives you a sound night's sleep every night. Egg Sleeper™ has an ergonomic design that cradles your head with comfort, instantly conforming to your shape, whether you're a back sleeper, side sleeper, or sleep on your belly. The secret is the filling made of 8 million micro-comfort spheres that evenly disperse the weight of your head and neck as you sleep. And you can say goodbye to night sweats. Regular pillows trap in hot air. But not Egg Sleeper™. Air goes right through for a cool night's sleep. Egg Sleeper™ is machine washable, hypoallergenic, and fits in any standard pillowcase. It's great for neck pain, muscle pain, migraines, and more! If your pillow makes your neck sore and your headache, try the amazing new pillow that's so soft and comfy even eggs won't break. Get your Egg Sleeper™ Pillow now for only $29.99 and receive FREE shipping and handling. But wait - double your offer and get a SECOND Egg Sleeper™ Pillow, perfect for doubling up or adding to the other side of the bed. Just pay a separate fee of $14.99. This offer isn't available in stores, so order now. Check out these other great products by Egg Sleeper. OFFER: Get your Egg Sleeper Pillow now for only $29.99 and receive FREE shipping and handling. But wait - double your offer and get a SECOND Egg Sleeper Pillow, perfect for doubling up or adding to the other side of the bed. Just pay a separate fee of $14.99. This offer isn't available in stores, so order now. GUARANTEE: Your satisfaction is 100% guaranteed. If you are dissatisfied with your Egg Sleeper for any reason, simply return the product within 30 days for an easy refund of your purchase price, excluding shipping and handling. See our return policy for more information. Exceptions may apply.